We have an abundance of carpets and rugs on display to help customers see how a floor covering will look and get an idea of its feel. 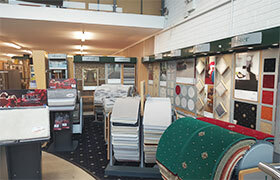 You can choose from comfortable lounge carpet options to durable stair carpet ideas at any size or budget. 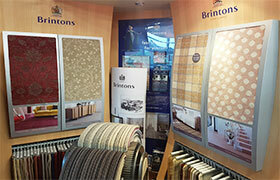 Many of our fitted carpets are now stain resistant such as the popular seller Sensation. We supply to all sectors such as residential, commercial, health sector or education. Whether you need a comfortable carpet for your home or safety requirements for your business, we have the range and quality to fit your needs. 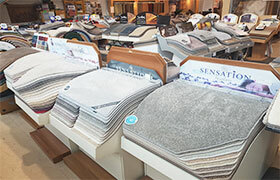 We stock a range of carpets for your home such as stain free Sensation and Signature. 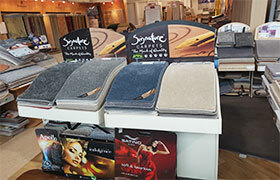 Signature creates beautiful hand made luxury fitted carpets and large area rugs. Each one is special and designed to work perfectly with all other elements of your carefully selected interior design. Offering a wide range of commercial grade carpets and carpet tiles that are suitable for even the most heavy wear applications. Our commercial range are supplied by some of the leading brands that are super hard wearing and highly durable. We supply and fit for hotels, offices, schools, nursing homes, student accommodation, hospitals, social housing, new builds and retail outlets.